Discover the legendary atmosphere of Paris in your own furnished apartment. A short passing through or a longer stay, we would be pleased to help you find the right apartment. We assure personalised service to all our clients. Small details are important to us. Quick answers and easy bookings. We are a small dynamic team with long experience of tourism in Paris. 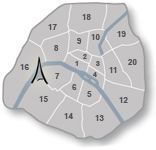 A range of services will give you more time to enjoy Paris. We would be pleased to answer your questions and we look forward to meeting you in Paris.